Toronto, Canada: October, 2012 – On Wednesday, October 10, Daniel Libeskind’s L Tower became an aerial playground as five members of the Vancouver-based Aeriosa Dance Society whirl and twirl down its north façade to the sounds of J.S. Bach’s ethereal “Six Suites for Unaccompanied Cello,” played live by Toronto musician Liza MeClellan. The performance kicked off the L Tower’s “topping out” ceremony marking the completion of the skyscraper’s skeletal structure and almost half of its glass-and-steel façade. 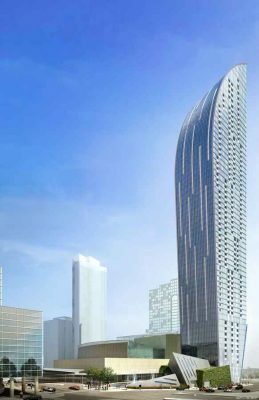 The 58-story condominium designed by Mr. Libeskind with Page + Steele/IBA Architects for Ferncastle (Front Street), Inc., will welcome residents in 2013. 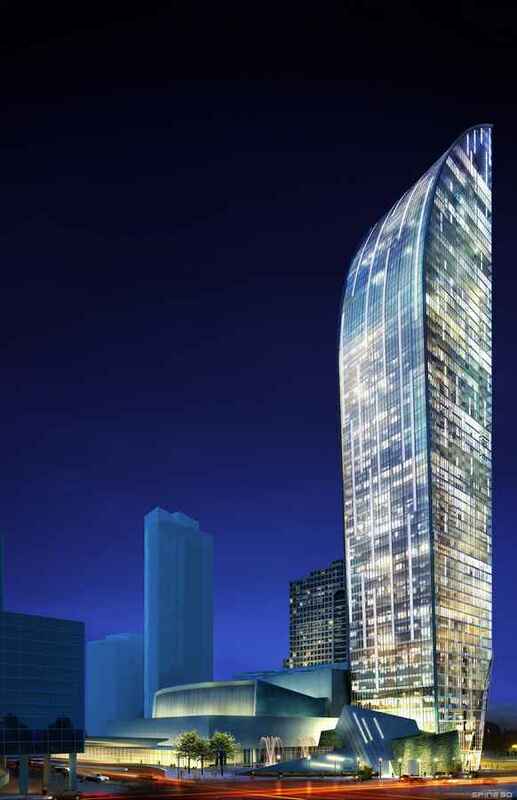 The tower, located at the intersection of Yonge Street and The Esplanade, is part of the redevelopment of the Sony Centre for the Performing Arts. A Partnership with Ferncastle (Front Street) INC raised capital for the Restoration and Renovation of the Sony Centre (Phase 1, Theatre interiors were completed in 2010). Phase 2 including new back-of-house facilities located beneath a new public plaza which will reach completion along with the tower. The L Tower was designed to be an architectural transition between the skyscrapers of the financial district to the west and the historic residential St. Lawrence neighborhood to the east. A 5000 square-feet public plaza along the redevelopment’s west side will serve as an additional public space for the theater, L Tower residents and the downtown community. 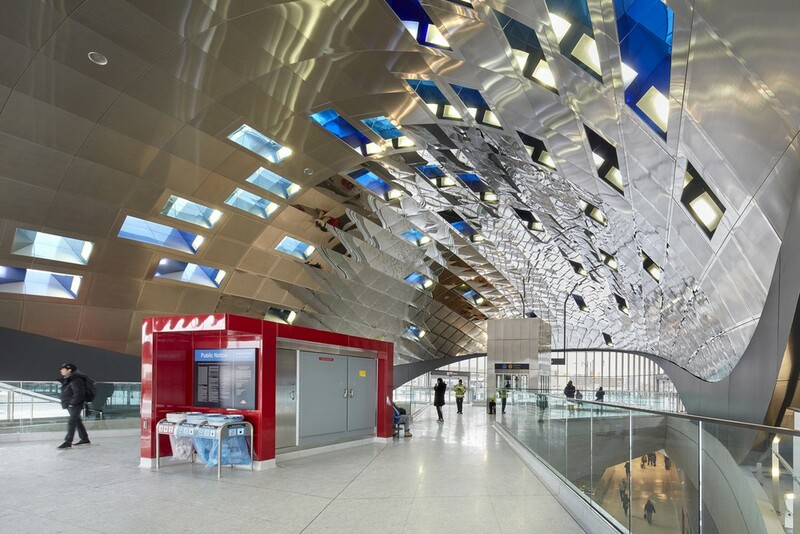 Named for its dramatic, streamlined “L” shape, the building shoots up into the sky with bold, clean lines, its articulated glass-and-steel facade accentuated by expansive windows and balconies. Each of the 593 units, many of which feature ceilings of nine feet and higher, has stunning views of downtown, Lake Ontario and the surrounding area. The form of the tower with its gently curving north façade ensures that development does not cast shadows on Berczy Park towards the north. Toronto design firm Munge Leung created the tower’s high-end interiors. The kitchens feature Munge Leung’s signature cabinetry, stainless steel appliances, granite countertops and engineered hardwood floors, while the bathrooms have marble countertops. A 24-hour concierge, spa facilities, a private cinema, a lounge, a library and catering kitchens for residents and their guests are among the building’s other signature amenities. The L Tower is Daniel Libeskind’s third Canadian project. His 100,000-square-foot extension to the Royal Ontario Museum, now called the Michael Lee-Chin Crystal, opened in June 2007. The Wheel of Conscience, part of the Canadian Museum of Immigration, opened in Halifax in 2011. The memorial honors the passengers on the M.S. St. Louis, a ship carrying Jewish refugees from Nazi Germany that was turned away by the Canadian government in 1939.